Classic Guardian Bell | LM-BEA1093Guardian Bell-protects bikers from evil road spirits and demons! A completely lead free bell made of heavy pewter.Comes with a neat velvet pouch.Made in the USA!.. Fleur de Lis Guardian Bell | LM-BEA-1080Fleur de Lis Guardian? Bell- Protects bikers from evil road spirits and demons! A completely lead free bell made of heavy pewter. Comes with a velvet pouch. Made in the USA!.. Guardian Bell-protects bikers from evil spirits and demons!A completely lead free bell made of heavy pewter.Comes with a neat velvet pouch.Made in the USA!.. Holy Cross Guardian Bell | LM-BEA-1020Cross Guardian? Bell- Protects biker from evil road spirits and demons!A completely lead free bell made of heavy pewter.Comes with a velvet pouch.Mad in the USA!.. John 3:16 Guardian Bell | LM-BEA1054Guardian Bell-Protects bikers from evil road spirits and demons!A completely lead free bell made of heavy pewter.Comes with a neat velvet pouch.Made in the USA!.. 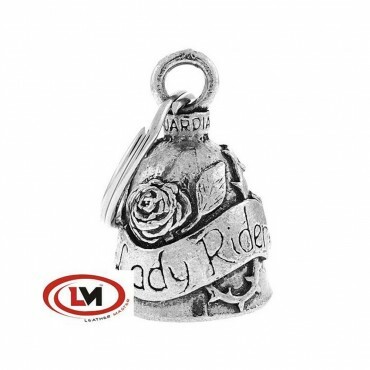 Lady Rider Guardian Bell | LM-BEA1017Lady Rider Guardian Bell is made out of heavy pewter, is completely lead free and comes with a neat velvet pouch.Hang this bell on your bike! Legend has it that Evil Road Spirits have been latching themselves on to motorcyclesfor as long as there have bikes on the road.These Evil Ro..
﻿Ride to Live Eagle Guardian Bell | LM-BEA-1081Ride to Live Eagle Guardian? Bell- Protects bikers from evil road spirits and demons!A completely lead free bell made of heavy pewter.Comes with a velvet pouch.Made in the USA!.. Bell is made out of heavy pewter, is completely lead free and comes with a neat velvet pouch.Guardian Bell protects bikers from evil road soirits.Made in the USA!..